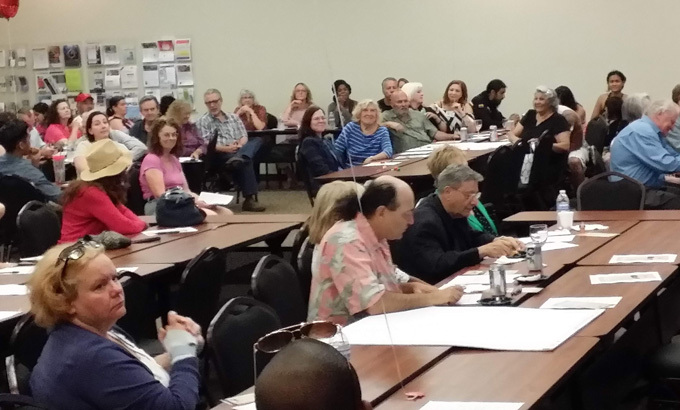 The Murrieta Arts Council had its "Forum for the Arts in Murrieta" meeting on Tuesday night. It was open to the public and considered a very big success. Around 80 of the area's performers, artists and writers attended, along with crafts people, teachers, school administrators and arts supporters. The location was the SRCAR building on Jefferson Avenue. The evening began with Mayor Randon Lane telling the crowd about the importance of the arts and this Council. MAC President Jessica Large then told everyone how the leaders of MAC came together and that the mission is "to encourage and support community endeavors for the enhancement of arts and culture in the Murrieta Valley". She also described how the organization will grow as it brings on more Board members and liaisons. The liaisons will create subcommittees for each artistic discipline (music, visual arts etc). They will then present their ideas and requests for help to the MAC Board of Directors. In some cases there may be two liaisons -- for example, one for ballet and one for modern dance. There were table discussions, which also helped MAC members know the attendees' ideas and priorities. As the evening concluded, many who attended expressed great excitement about working with the Murrieta Arts Council, to develop new and better opportunities for the many talented people in this area.